The McArthur River winds 150 miles through the remote Northern Territory of Australia before emptying into the Gulf of Carpentaria. Here, the region’s four linguistic groups — the Yanyuwa, Gurdanji, Garawa and Mara — tracked songlines, a mapping of sacred sites and stories, across their landscape. For Aboriginal Australians, the entire river is respected as the Dreamtime pathway of the Rainbow Serpent, one of the most important of the ancestor spirits who formed the land and still enforces the law. The river is the home of the Rainbow Serpent and the heart of its songlines. 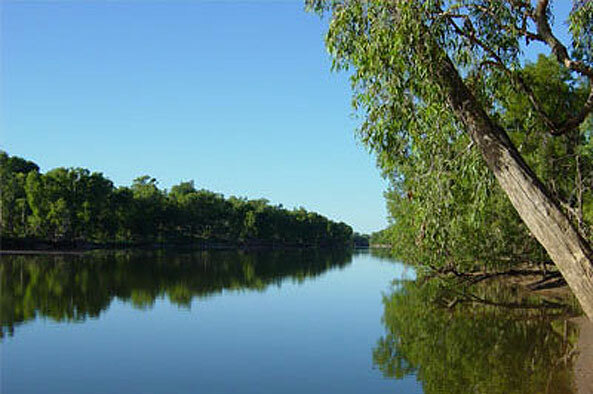 The McArthur River is known for its exceptionally high marine biodiversity. The Borroloola and the Sir Edward Pellow Islands in the gulf support sea turtles and one of the world’s most important populations of dugong, a manatee-like mammal, which the International Conservation Union lists as a vulnerable species. The McArthur has always been a source of life and livelihood for the region’s Aboriginal people, who have traditionally harvested marine life from the river and the gulf. Discovered in 1955, the ore body at McArthur River Mine is one of the world’s largest zinc and lead deposits. The government fast-tracked the original environmental assessment and has subsidized the operation since it began, in 1995, with funding for major infrastructure and concessions on taxes. Although local Aboriginal groups hold native title to the land under the 1977 Aboriginal Land Rights Act, the mining company failed to consult them in negotiating the operating agreement. The communities in the area noticed sickness in dugongs and turtles downstream of the mine soon after it began operating. In 2001, seasonal flooding caused a breach in the tailings pond, sending contaminated water downriver. Community members reported seeing thousands of dead fish in the bay and shellfish dead on the sand. In succeeding years they say they watched the river system change: more sand from upriver, more erosion; the disappearance of fish, turtles, coral reef and sea grass; and a warning from doctors to avoid eating mussels and oysters. The global mining group Xstrata, based in Switzerland, acquired the original operator, MIM Holdings, in 2003. Until 2007, MIM/Xstrata paid no royalties to the regional government, thanks to a Northern Territory provision that requires mining companies to pay royalties only on the profits they make, rather than on the amount of ore they extract, as is the case in other Australian jurisdictions. Meanwhile, Xstrata reportedly collects yearly government subsidies amounting to around Australian $8 million. In 2005, with most of the accessible ore in the underground mine already extracted, Xstrata announced plans to convert the mine to an open-pit operation — a decision motivated by a growing global demand for zinc, along with improved refining methods and the potential to reduce operating costs. But such a shift required diverting a three-mile stretch of the river to access the ore body beneath it. At first, the Northern Territory environment minister rejected the proposal, and the NT Environmental Protection Agency expressed serious concerns, including the “significant risk” of contaminated seepage into local groundwater, and noted the local indigenous population’s strong opposition to the diversion. However, in October 2006 — just as more than 40 traditional owners from Borroloola were preparing to stage a protest in Darwin, the territory capital — a newly appointed mining minister announced approval for the project by accepting the mine’s management plan. The plan reportedly addressed the major concerns about environmental impact, sacred site protection, and community compensation, although only the NT government was allowed to see it. The federal environment minister followed suit a few days later. Aboriginal landowners sued, and in December 2008, the Australian Federal Court found in their favor and invalidated the government’s permit for the mine expansion. Mining operations came to halt while Xstrata resubmitted its application to the federal environment minister. With the looming threat of job losses as the mine remained idle, the government in late February 2009 approved the expansion, and operations recommenced. While local traditional owners hold native title to the mine site, they do not have veto rights over mining plans. Community representatives said that throughout the process, neither Xstrata nor the government adequately consulted them about the mine proposal. Presently, Xstrata is initiating yet another expansion phase, proposing to increase mine production 5 million tons per year — more than double its output in 2010 — and thus extend the life of the mine by six years, to 2033. The company announced its plans to shareholders and the media on March 11, 2011, but did not directly communicate with traditional landowners until three days later. Xstrata’s past failure to reach out to the Aboriginal community over its switch to open-cut mining and include them in planning left lasting damage. According to a 2010 company survey, less than 30 percent of stakeholders thought the company did a good job communicating with the community on important issues. Now, Xstrata has again failed to reach out and communicate directly with the community regarding its latest expansion plans, to the dismay of community leaders. Xstrata expects to begin the project in 2012, pending government approval. It says the expansion will not require further river diversion or extension of the open pit beyond current boundaries. The company claims the project will bring a boost in employment opportunities, with 900 positions during the peak of a two-year construction phase and about 110 operational jobs after that, bringing the permanent staff to about 550. It also notes that since 2006, it has increased its indigenous workforce from 9 percent to 21 percent of its staff. But jobs don’t mitigate the ongoing concerns of traditional landowners and conservation groups, who worry that the mine, which is located in a floodplain, could contaminate the river with heavy metals during floods, threatening the freshwater sawfish, migratory birds, and turtles as well as damaging the seagrass habitats that support the dugong population and the commercial prawn fisheries in the Gulf of Carpentaria. Nor does it allay the fears of the Gudanji and other Aboriginal groups that storms, floods and other natural disasters might be the price to pay for moving the river and failing to respect the Rainbow Serpent. Mabo v. Queensland No. 1 challenged this legislation, arguing that it violated the Commonwealth Racial Discrimination Act 1975, and the judges ruled in favor of the plaintiffs. In 1992, a few months after Eddie Mabo passed away, Mabo v. Queensland No. 2 was decided. Six of seven judges ruled that the Merriam people had traditional ownership of the land, which replaced the doctrine of terra nullius (no-man’s land) on which British claims to the land were based. In 1993, following the decision of Mabo No. 2, the Commonwealth Parliament passed the Native Title Act, which allowed indigenous people in Australia to make claims of traditional right to unalienated land. Australian Conservation Foundation. “NT Environment Minister Says No to McArthur River Mine Expansion Plan.” Last modified February 23, 2006. Australian Conservation Foundation. “Mine Approval a Concern for Northern Australia.” Last modified October 20, 2006. Deibert, Michael. “Xstrata Dreaming: The Struggle of Aboriginal Australians against a Swiss Mining Giant.” CorpWatch, February 16, 2009. Environment Centre Northern Territory. “Current Campaigns.” Accessed June 15, 2009. Keane, Bernard. “Life Under NT’s Profit-Based Royalty Regime: Xstrata Has No Complaints.” Crikey, June 9, 2010. Northern Territory Government. Assessment Report 54: McArthur River Mine Open Cut Project. Environmental assessment report, August 2006. Squires, Nick. “Stop Digging Down Under?” Christian Science Monitor, October 16, 2006. Trevarthan, Rachel. “Mining Company Clout Overrides Sacred Aboriginal Site.” CCN Online, October 31, 2006. Xstrata. “Xstrata Zinc: Integrated Development Plan to Secure Future of McArthur River Mine.” News release, March 11, 2011. Xstrata. “Our History.” Accessed September 28, 2011. Xstrata. “Xstrata Zinc: MRM Pays First Royalties to Northern Territory Government.” News release, July 16, 2007.